Thanks to the generosity of the Cottage Grove Historical Museum, we have recently been able to expand upon our available issues of the Cottage Grove Sentinel! 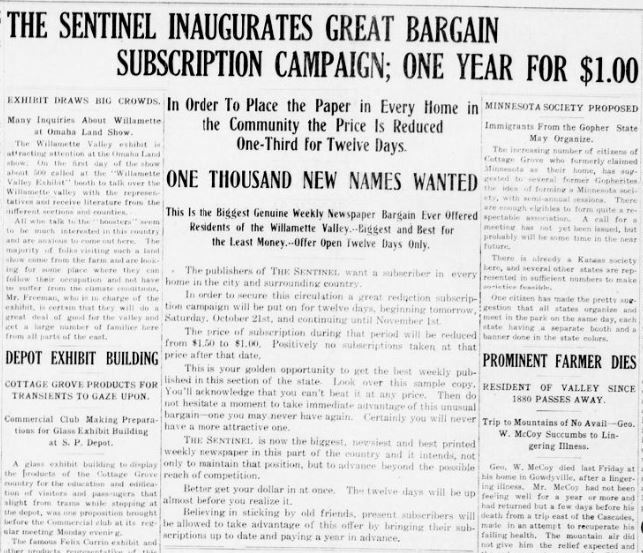 This new content added to the Oregon Historic Newspapers website covers the early years of the Sentinel, a wonderful addition to the current issues we already have digitized. The new issues span from 1909 to 1918, and showcase the aspirational personality of one of Oregon’s most famous editors, Elbert Bede. Quoted by Oregon’s historic newspaper expert George S. Turnbull, Elbert Bede was “the one man who spent the most time, did the most work, [and] became the best known as the Cottage Grove Editor.” (Turnbull, 269) Bede’s entrepreneurial spirit is evident throughout the newly added historic issues of the Cottage Grove Sentinel, especially in articles like the ones below which were published shortly after Bede took ownership of the paper. If you want to learn more about the Cottage Grove Sentinel, Elbert Bede, or historic newspapers in general check out our collection of digitized historic newspapers on the Historic Oregon Newspapers website! Doing research through ODNP is easy thanks to optical character recognition (OCR), which allows all of our historic newspapers to be keyword searchable. In addition, this newspaper can be downloaded as a PDF or JPEG file and saved for future reference or research purposes. All of these services are free and fully available to the public, so don’t hesitate and take a look at what historic Oregon was like through the newspapers that documented it! Turnbull, George S. History of Oregon Newspapers. Binfords & Mort, Publishers. Portland, OR. 1939. ‹ New Paper from Independence, OR!